When you stay at Sweetwater Branch Inn in Gainesville, FL, your getaway will be full of fun! During the day, the area around our inn beckons to be explored. Make your way through forests on beautiful trails or walk the streets of historic downtown. Whether you want to shop or adventure, there is something for everyone! But what are some things to do in Gainesville at night? We’ve got you covered! Gainesville has acquired a thriving brewery scene over the years. They’re great to go to for a tasting during the day, but many are open late hours into the night! Try one of our favorites like Cypress and Grove Brewing Company. Many gather here every weekend to listen to the live music and drink their delicious brews. Although it can get crowded, this brewpub always has a great energy. Get a true taste of Gainesville with their beers that are all made from local ingredients! Come be a kid again at the Arcade Bar. The 3-story building combines drinks and gaming to create your ultimate night of entertainment! This adult playground is filled with bars, seating, and more games than you could imagine. When you step into the game room, it’s like stepping back into your childhood. 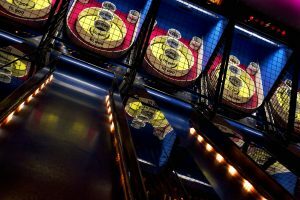 Come to see your favorite sports team play on one of their TVs, then end the night challenging your friends to a game of foosball or beat their high score at Pacman. Best of all, it is less than a 10-minute walk from Sweetwater Branch Inn, making it the perfect place to experience some nightlife during your stay. If you’re looking for something special to do during your trip to Gainesville, Florida Fun Bikes is for you! Whether you’re in town for a birthday or bachelorette party, you’ll love going on a pub crawl by bike. Choose from various tours throughout downtown that all go to an array of popular bars and restaurants. You’ll love the drink specials available at each stop, then hop back on and pedal the night away with friends or family! One of the most important parts of vacation planning is figuring out where to stay. You are sure to love staying at Sweetwater Branch Inn! Whether you’re looking for cottages perfect for a bachelorette party or a suite in our historic Victorian inn, we’ve got you covered. Not only do we offer all the amenities you would expect in a world-class inn and more, we are also moments away from tons of things to do in Gainesville at night! It’s time to start planning and book your stay today.